A friend of mine has a blog where she discusses her feminist ideals as well as books which relate to feminism. She gathers ideas for what to read from varying sources and reads across a wide range of genre and time. The Summer of the Great-grandmother was difficult for her to track down, so I borrowed it for her from my library system(sshhh don’t tell them). When she returned the book to me she suggested that I read it as well, since some of the topics covered are of interest to us both. I figured why not? I am not disappointed in my choice to read Ms. L’Engle’s book. In fact, I should probably announce right from the beginning that this is the only L’Engle book I have ever read (yes, that means that I have not read A Wrinkle in Time). I did not know what to expect as far as authorial style but I must say that I was pleased to spend several evenings in the company of Ms. L’Engle and her family. For, although the book does focus on the end of life care for the titular great-grandmother, L’Engle’s own mother, it also delves into the various stories of those who came before – sometimes tracking Ms. L’Engle’s roots back to her three times great-grandparents and the type of life they led in the early 19th century. In fact, as Ms. L’Engle was born in 1918 many of the stories she recounts take place in 19th century America, and more specifically in the post-Antebellum South. I was born in the north, and raised in the South. I am of two minds about almost anything. I have a cutting Northeast-based way of handling coworkers and friends, but sink back into a more demure, Southern way of handling instances where I feel put-upon or diminished. L’Engle very effectively shows the reader the various strings of familial ties which led to her own personality and that of her mother as they are both simultaneously of two worlds. The book is broken up into sections which travel in reverse time order. The first section deals with the great-grandmother as she was that final summer – sinking into the debilitating effects of atherosclerosis. The second focuses on the mother of Ms. L’Engle’s memory, where the reader learns not only about the great-grandmother, but of the author in equal doses. The third focuses on the great-grandmother’s life before the birth of her only child at age 38, as L’Engle describes “the mother I could never truly know” and the family history of ‘tell me a story’. The final portion of the book deals with L’Engle’s experience during her mother’s death. This is not a light fluffy read, nor is it a lecture. It is merely the musings of a highly educated and highly imaginative woman as she deals with the decisions we will all likely face. How do we decide what’s best for our loved ones at the end of their lives? I couldn’t recommend this one more highly. Somehow I managed to not review this one for three weeks. I am unsure how that occurred. I know I started writing this review several times, I guess I haven’t finished it until now. The third Anne book is almost as good as the first two. I don’t know if reading any of the following Anne books will be as wonderful as reading the first, but they all fall nicely into the heart. Anne of the Island finds our hero attending college, and all that means. What I learned about myself reading this one is that it is difficult to watch anyone you care about go through the pratfalls and indecisions of late adolescence. While much happens in these books the plot point which stands out to a reader looking at the long game is Anne’s relationship with Gilbert. At the beginning of their sophomore year at Redmond Anne and Prissy, Phillipa, and Stella have been able to rent the adorable little house along the park where many wonderful things happen. But it is also here that Anne turns down the marriage proposal of Gilbert. In fact, Anne turns down not only Gilbert, but four others as well over the course of the four years in Kingsport. It isn’t until the end of the fourth year that Anne discovers she was very wrong in her notions of romantic love. There’s lot s else happening with Anne as she ages from 18 to 22 and discovers life on her own terms. Her best friend is married and has a child, the sale of her very first story, to name but a few. The overarching feeling I had while reading the adventures of Anne and her friends was that I wanted to sit and talk with them the way I sit and talk with my sister who is about the same age these days. This did not lessen my enjoyment of this book in the slightest. I love Anne. I love how she strives for goodness, embodies true friendship, and endeavors to live by her principles. Although much has changed in Anne’s world she and Marilla have settled into a relationship of easy affection and mutual respect. In this outing we experience a string of events in Anne’s life over the course of two years picking up after she decides to put off college following the death of Matthew. Like all new teachers Anne has some idealistic and rather unrealistic notions of what she can achieve, but that does not stop her from trying and eventually achieving a great deal. Not to worry though, our Anne continues to find herself in and out of scrapes including accidentally dyeing her nose red. It’s against the backdrop of teaching young minds that Anne seems to come into herself as an adult. By the end of the novel she has taught the three Rs, she has also learned how complicated life can be. Anne’s adventures include forming the Avonlea Village Improvement Society, meddling in her neighbor’s romance, and helping Marilla bring up two orphans at Green Gables. There’s an undeniable undercurrent in the book about romance. In fact, marriage and married life is one of the strongest elements of the book and the theme of communication in relationships between women and men and the danger of unhappiness caused by unresolved misunderstandings is played out over and over again in the various stories encapsulated in each chapter. 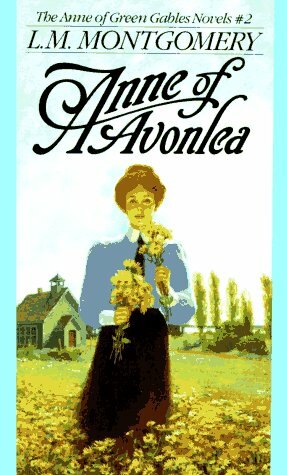 The reader glimpses into the stages of relationships from the eyes of Avonlea. Mrs. Rachel Lynde’s husband is ill, and she must deal with his death and what that means for her future. Mr. Harrison’s tale of separating from his wife over a prideful argument and her eventual return to him on Prince Edward Island shows another side of the theme. Miss Lavendar and Mr. Irving finding each other again in their ‘old age‘ and moving beyond the prideful fight that had separated them in their youth. There are also a variety of other couples and old maids in the neighboring environs whom Anne interacts with. As Anne encounters each of these characters she also must deal with her own ideas of her future. As any true friend should Diana attempts to point Anne in the right direction, to which Anne asserts that she will find her ideal or she will happily remain unmarried. This leads inevitably, to Gilbert Blythe. Ms. Montgomery shows her authorial hand just once, but it’s unmistakable. “Gilbert stretched himself out on the ferns beside the Bubble and looked approvingly at Anne. If Gilbert was asked to describe his ideal woman the description would have answered point for point to Anne, even to those seven tiny freckles whose obnoxious presence still continued to vex her soul.” Gilbert’s time at White Sands is greatly ignored throughout the narrative, but there are hints that there are many in the teenage set that displayed loose morals, to Gilbert’s eyes. He had made up his mind that his actions now must match the future he envisioned with Anne. To the faults – in my mind the new young children made for the most grating parts of the narrative. While Dora and Davy Keith add life to Green Gables and show Marilla and Anne’s growth it is hard to be enthralled with either of them. Dora is so well-behaved and plain as to be wholly forgettable and it seems Ms. Montgomery felt the same as she is absent from the story quite often. Davy is so mischievous that the reader simply wants him off the page. Davy is, I’m rather sure, meant to show the growth in Anne herself from her own impetuous youth, but instead simply grates on the nerves. Then there is Anne’s favorite student Paul Irving’s grating habits. Paul seems too good to be true, and combines every one of Anne’s more imaginative habits. But I think the part of the writing of this character, and others which grated on my nerves the most was his speech pattern. Montgomery developed for her characters very specific mannerisms and speech patterns and Paul’s is ‘well you know teacher’. He intends it as an inside commiseration of two kindred spirits but I could not help but to read it as whiny pre-teen speech patterns. However, I love spending time in Anne’s world and would recommend this series to the adult reader who may have missed it in their own growing up years. I find myself sitting to type of this review minutes after completing the reading of Whom the Gods Love by merit of the fact that in the wake of Hurricane Sandy there is little else for me to do. Perhaps it is the reality of the damage done to my home state, the weeks of recovery in front of all of us, the lack of internet and phones, or the amount of deaths in this Julian Kestrel novel that leave me feeling vaguely melancholy. It could also be the realization that there is only one more book by Kate Ross for me to consume. Whom the Gods Love is filled with literary allusions and death. The book picks up a small while after the activities of A Broken Vessel finding Julian and Dipper back into the normal pattern of life. That is, until Julian is approached by Sir Malcolm Falkland, father of the deceased Alexander Falkland. Sir Malcolm is distraught, the Bow Street Runners have run into a dead-end and the Quality won’t fully participate in the investigation. Sir Malcolm approaches our amateur sleuth to piece together the mystery of who would kill such a popular young man. Julian takes on the challenge, if only to occupy his time and give Sir Malcolm peace of mind, but it quickly becomes clear that there is much more below the surface than Sir Malcolm or any of Alexander’s acquaintances could have known. Ms. Ross utilizes a character list in the beginning of this book, partly because there are so many characters to keep track of, and partly I think as a nod to Shakespeare’s The Merchant of Venice which gets referenced once again. While this book had a slow start I’ve decided to give it a three star rating because it’s full of historical insights and kept me guessing about the mystery at hand.